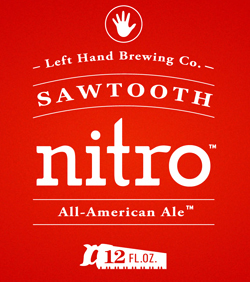 One of three nitrogenated bottled beers from Left Hand, Sawtooth Nitro is an American style ESB. I’m a sucker for presentation, and watching the cascading effect in this nitrogenated ale—while not as dramatic as say a stout—is pleasing to the eye. There is not much in the aroma department, some faint fruit, and while the smoother carbonation is a little jarring, it does let the nutty flavors shine a little brighter. A full mouthfeel. There is not much of a hop presence, but this is an easy drinker that doesn’t leave you feeling full. Points to the brewery, which has proprietary technology for nitro bottles, for going beyond the stout. While I’m OK with giving stouts the nitro treatment, I’ve always thought it a curious thing to inflict on pale ales and bitters, since it seems to mute the hoppiness we all want from such styles. As it does here, although not entirely to the beer’s detriment. Yes, Sawtooth Nitro is less aromatic and bitter than is regular Sawtooth, but the nitro-induced creaminess is oddly appealing, as is the appley body and nutty finish. Better by degrees than the vast majority of its British nitrogenated kin.